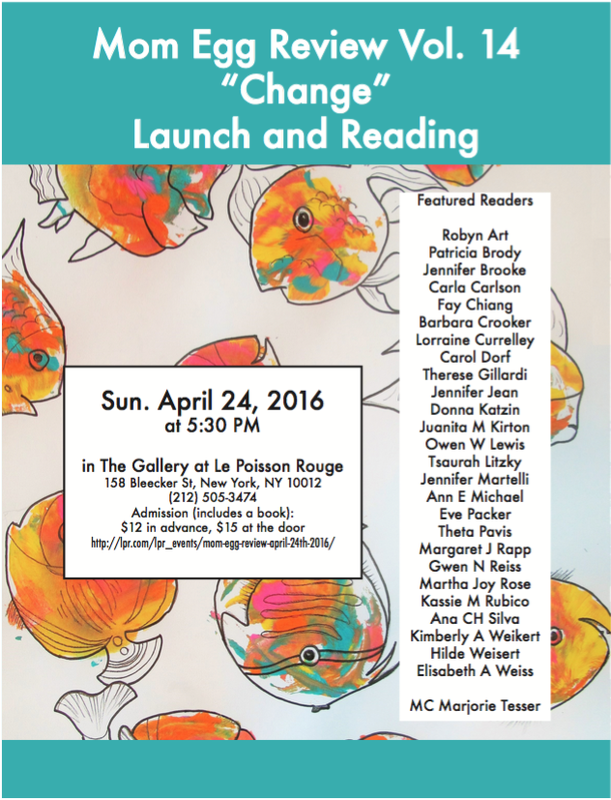 Sunday, April 24th from 5:30-9 PM at the Gallery at Le Poisson Rouge, NYC. You are invited to come and read! We hope you can join us at the launch to share your work and connect with other Mom Egg Review contributors and friends. Contributors to this issue are invited to read one short poem or prose piece (up to 1 ½ typed pages), 3 minutes max. You can read the piece that is in the issue or a different one. If you’d like to read, please let us know as soon as you know your schedule. 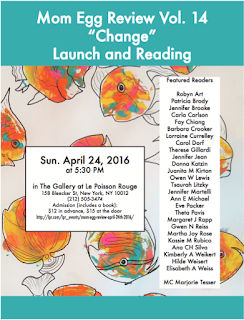 To read: RSVP by 3/30 to themomegg@gmail.com with “Launch Reader” in the subject line. The venue has a full bar and also a food menu. The reading is open to the public, and friends and family are welcome. (Minors may attend with parents; please note that readings are geared for adults). Advance tickets for contributors and guests can be purchased ahead online at the link below (this is a special no-fee link for contributors—if you purchase through LPR there is a convenience charge). The ticket includes one copy of the issue, which will be delivered at the event.